it seems the only thing to chase away a wretched cold is to lock oneself away in a tiny studio and work nine hours a day. My health has improved, somehow I caught up on my sleep quota, and I produce a many fine item. This neckpiece, as I mentioned in an earlier post, will be heading to the Salty Teacup in Portland, Oregon for their grand opening on April 2nd. 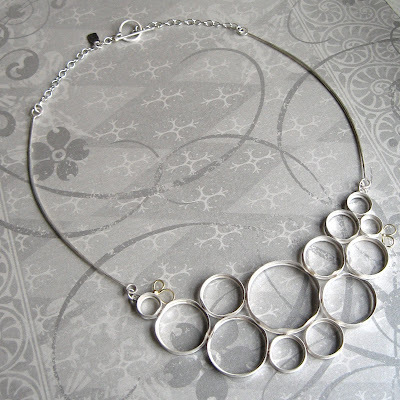 I really should take some photos of the finished piece as I oxidized (of course!) 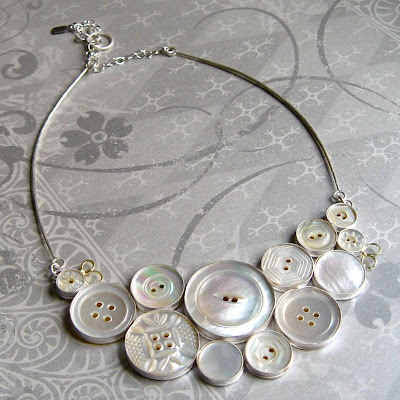 the necklace before setting the buttons. The piece below is for my own inventory. I included two porcelain cabs from Magpie Pottery. I LOVE. LOVE LOVE Maggie's work! I apologize. The photo does not do the colors justice. burgandy than the photo suggests. a vendor again this year! Is it too early to start talking fairs? I certainly have to think 6 months ahead of now....that puts me in early Septmeber with 3 shows over and done with, happily eating tomatoes straight from the vine, and enjoying the wonder that is late summer. Wow...you do really, really great work. I agree, there is absolutely nothing like a day in the studio to make anything better! Thank you, Metallo Bianco!!! Every minute in studio is precious especially when there is a little person running around demanding attention (yay for naps and preschool!!). Please feel free to email me! 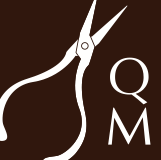 metalsmith, jeweler, artist, mother, wife, gardener, collector, teacher, friend.